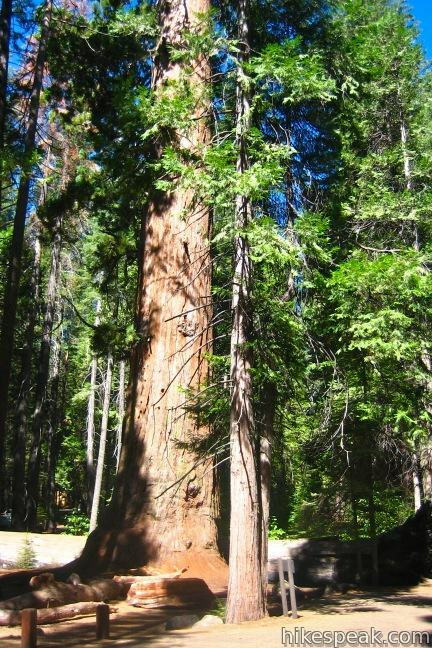 Ever wonder what happened when settlers first set eyes on giant sequoia trees? 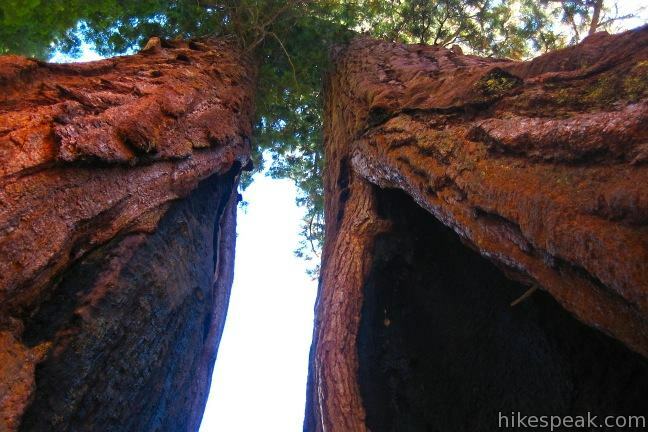 Relive the excitement of that discovery and see the enormous trees for yourself at Calaveras Big Tree State Park. 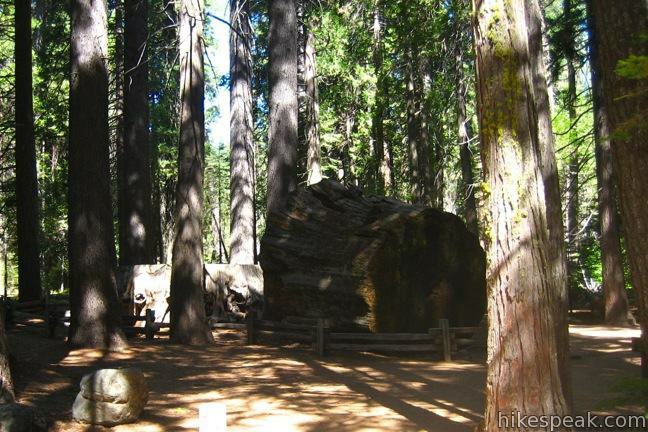 The 10-square mile park has two groves of sequoias, two campgrounds, picnic areas, and a number of hiking trails. You could easily spend a couple days exploring the park, but if you only have one afternoon, hike through the storied North Grove on a 1.5-mile self-guided loop. As the legend goes, a hunter named Augustus Dowd discovered the North Grove in 1852. While pursuing a bear, he stumbled upon something quite larger – a tree three hundred feet tall and twenty feet across. No Caucasian had ever seen a giant sequoia before, and when he reported the discovery back in Angels Camp, he was met with disbelief. To prove his story, Dowd led a group back to the grove. The wonder quickly spread – as did the skepticism. To persuade those who suspected the giant sequoias were just a grand illusion, the largest tree in the grove was cut down and sections were sent to San Francisco and New York. It took five men twenty-two days to cut down the so named Discovery Tree. The Discovery Stump is all that is left. Later another tree, now called the Mother of the Forest, was stripped of its bark in another attempt to get people to believe in these unbelievable trees. 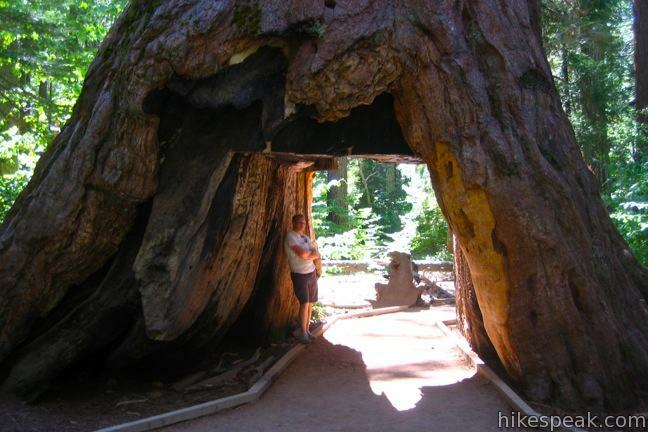 To entice more visitors, another sequoia had a tunnel carved through it, bringing the total of altered trees in the park to three. 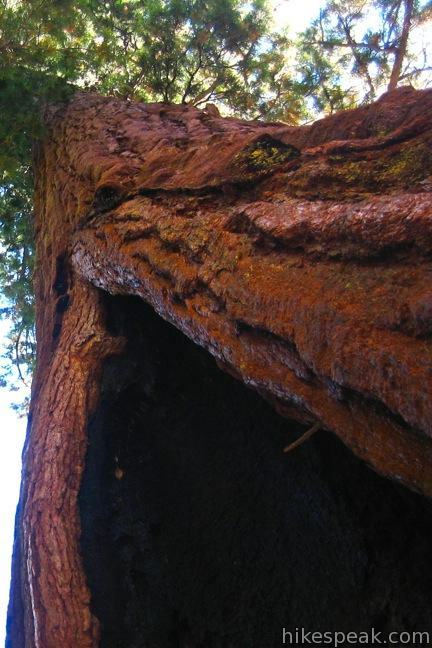 Fortunately, the other trees in Calaveras Big Trees State Park have been spared from harm. After decades of struggles by conservationists to preserve special areas like this, Californians voted to create the state parks system in 1928. 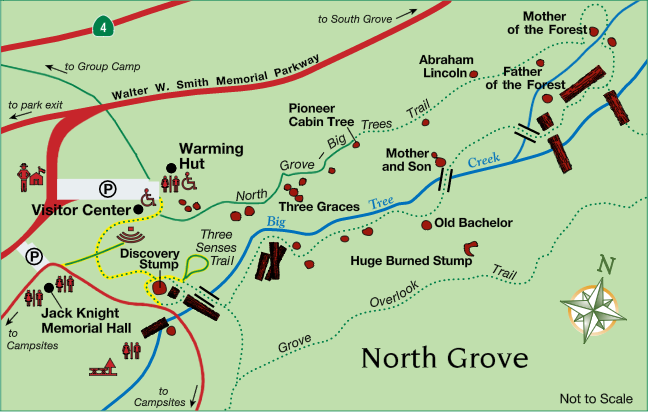 The North Grove became a state park in 1931, and the neighboring South Grove came under state protection in 1954. Visitors can walk through the tunnel in the Pioneer Cabin Tree and stand next to giant trees on a 1.5-mile loop through the North Grove. Big Trees Trail is level and well maintained with numerous panels that provide information about the grove’s history, plants, and animals. Update: Pioneer Cabin Tree fell in January of 2017 – Reporting by the New York Times and the Mercury News. The loop starts next to the Discovery Stump, the 24-foot wide remains of a 300-foot tall tree. 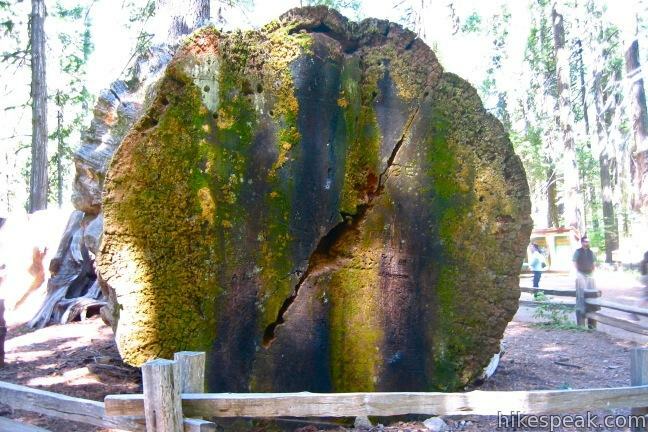 If you count the growth rings, you will see that the tree was 1,244 years old when it was cut down, which is somewhat young for a sequoia. The loop heads northeast from the Discovery Stump through a grove of sequoias bordering Big Tree Creek. Some of the other notable trees along the way are the Three Graces, the Mother and Son, The Abraham Lincoln Tree, and the Old Bachelor. 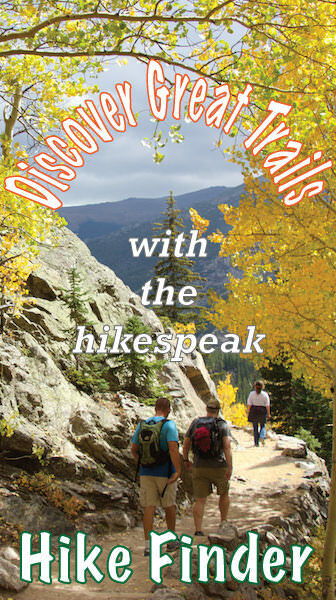 The self-guided nature trail is easy to follow and is typically completed in a counterclockwise direction. If the 1.5-mile loop through the North Grove leaves you looking for more, check out one of the other trails in Calaveras Big Tree State Park. Three Senses Trail, designed to accommodate touch, smell, and sound, is a short addition to the North Grove – Big Trees Trail. South Grove Trail is five miles long and visits the two largest trees in the park. River Trail descends steeply from North Grove to the Stanislaus River, and Lava Bluffs Trail provides additional river views. The park sports several picnic areas, a few of which are located next to creeks and the Stanislaus River so that summer visitors can have a swim and a snack. Winter visitors can snowshoe through the groves on ranger-lead outings. 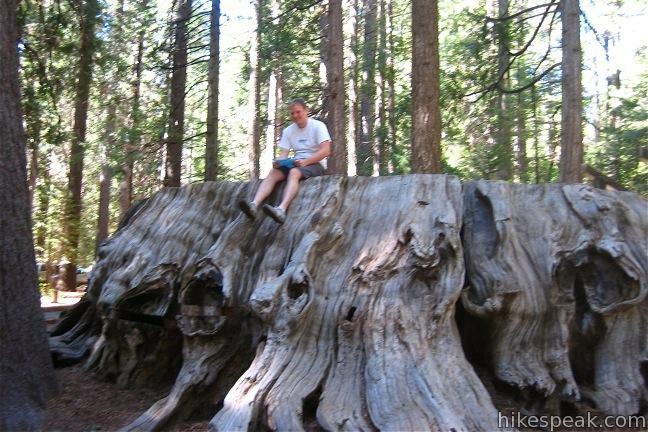 Calaveras Big Trees State Park is located in the eastern Sierra Nevada Mountains north of Yosemite National Park. Those who enjoy wine as much as hiking, should visit the nearby town of Murphys where dozens of wine tasting rooms offer another sample of the Sierra. Calaveras Big Trees State Park has a $10 entrance fee (as of 2017) but no permit is required to hike North Grove – Big Trees Trail, so get out and enjoy! To get to the trailhead: From Sacramento, it is a two-hour drive to Calaveras Big Trees State Park. Head southeast on Route 16 for 30 miles and turn south on route 49. Upon reaching Angels Camp, turn northeast on Highway 4 and drive 24 miles to the park entrance. From the west, take the 5 Freeway or the 99 Freeway to Stockton and head northeast on Highway 4, passing through the cities of Angels Camp and Murphys to reach the park. From the east, take Route 395 to Highway 89 West. Turn south on Highway 4 (which can close in the winter) and make the scenic but steep drive over Ebbetts Pass to the east side of the Sierra. These photos were taken in September of 2007. Click to enlarge. This fun 2-mile round trip hike descends into a canyon to a limestone tunnel in a creek (that you can swim through) in Calaveras County. Explore other destinations in the Sierra including Yosemite National Park. This 1.6-mile hike (or longer) visits the biggest trees in Yosemite. 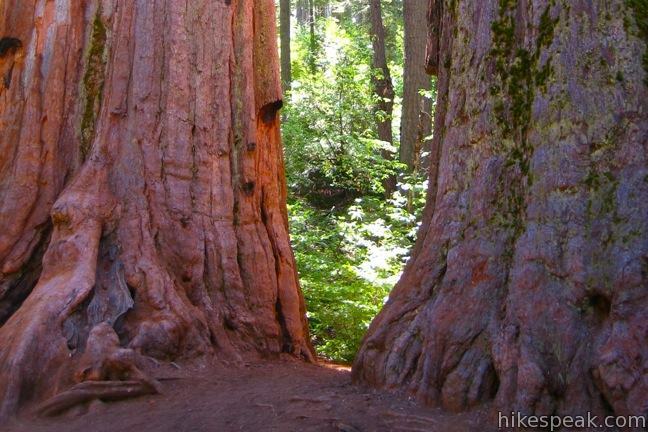 This one-mile hike visits the world's biggest tree, a 275-foot tall Giant Sequoia that is 36.5 feet across at the base. This 0-8 mile loop in the Grant Grove passes through a Fallen Monarch to reach the General Grant Tree, one of the world's largest sequoias. This 1.4-mile stroll explores giant sequoias around Round Meadow on a paved nature trail that is easy, educational, and beautiful. This paved 0.5 to 1.3-mile loop visits a grove of giant sequoias alongside Western Divide Highway. 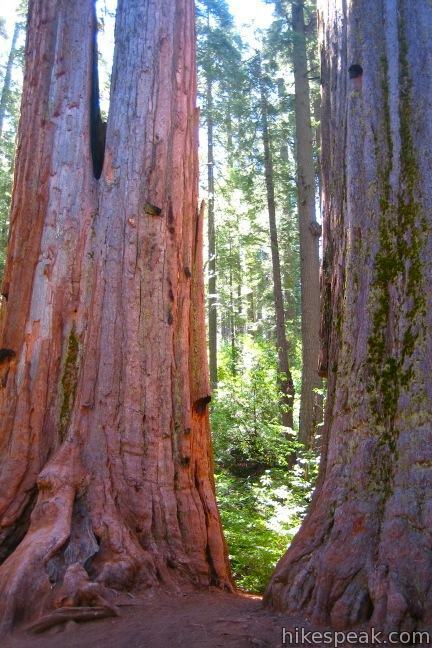 Calaveras Big Trees State Park has two campgrounds open to tents and RVs. The campgrounds offer picnic tables, potable water, fire rings, flush toilets, and coin showers. North Grove Campground has 74 sites and Oak Hollow Campground has 55 sites. During the busy summer season, be sure to make a reservation ahead of time. You may reserve a site online, or by calling 800.444.7275.